Review: My skin loves Garnier Light Overnight Whitening Peeling Cream! Update: Here’s your chance to win Garnier Light Complete Multi-Action Lightening Face Cream (contest runs til Sept 29, 2011)! 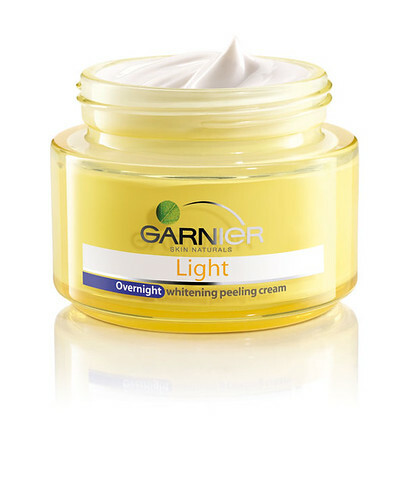 First on my review list is this Overnight Whitening Peeling Cream from Garnier. I was never a fan of night creams, because they’re too heavy and/or greasy on my already-greasy skin. There’s rarely a night cream that suits all skin types. And as for my skin which is sadly oily and acne-prone, most night creams I tried gave me horror stories to tell. This Garnier night cream is infused with pure lemon essence and natural peeling fruit extracts that exfoliates dark skin cells and peels off dullness as you sleep, revealing fresh and fairer skin in the morning. Not only will it lessen dark spots, but it will also prevent your skin from further darkening. Apply a liberal amount at night (after cleansing and toning), and wake up fresh and dewy in the morning! Verdict: Evens out my skin tone, and helps clearing out my skin! This is one of the very few night creams and moisturizers that my super sensitive skin agree with. Garnier Overnight Whitening Peeling Cream didn’t cause any adverse reactions on me. It didn’t irritate or break my skin out! So, it’s safe to assume that it really did a big help in gradually clearing my skin from those nasty zits I’ve been suffering for more than a decade. Now, I’ve never loved my skin like this before (scratch the pre-pubescent years, ‘coz my skin was flawlessly awesome then 😛 ). Worry not, ‘coz this won’t actually make the skin peel, which is a common aftereffect of chemical peeling treatments. I guess the term applies on its ability to strip off skin’s dullness. However, I notice that it didn’t actually lighten my skin tone up a notch, but it surely helped to even it out particularly in fading those dark spots and blemishes. My only concern is that it feels a bit greasy after application, so I always make sure to use a considerable amount (say, pea-size will do), rather than slathering a dollop of product on my face. Nevertheless, no scary breakouts were ever recorded the day after, just fresh-looking skin! This is a wonderful product review- thanks!… I would wonder what a “lightening” cream would do- and what a great price! i’ve been using garnier religiously for nearly 2 months now (foaming cleanser, toner, overnyt cream and day cream) and its just great! it doesn’t break me out! its the first product that i used continuosly cause the products i’ve used before give me a lot of zits so i discontinue them and find another.. and another..i dont even finih a single bottle or tube! and this has gone for a year. my face has ugly scars, and i never had a single pimple free day. so this is really record breaking.. 2 months of using a single line of product. GARNIER.. OVERALL: my face is fairer, more even, no visible pores, looks so young and supple.. the product also is nice under make up..and its relatively affordable and always available at depatment stores. lots of people notice the improvement on my skin and its just so amazing. hope the results continue on for a year or even longer. I have to tell you something. I’m just a guy who happened to accidentally bumped on a sachet of Garnier Light cream at some drugstore and decided to buy it. I don’t have much acne on my face but because of my continuous squeezing of the tiny bumps, I tend to get mild scratches. Hahaha. My uncontrollable habit scarred my face a bit and had a lot of dark spots. So I thought testing this one out since… well, it’s just 19 bucks. I tried using it after washing my face (with my body soap as usual). I thought the lemon scent would annoy the hell out of me but when I applied it, I was suprised. I thought I was about to eat it. Hahaha! No kidding, it smelled so nice, I didn’t notice I kept on applying it on my cheek one layer after another. Hahahahaah! Anyway, what I found about this cream is that it made my skin flat. I mean flat… smooth, no bumps, and I was like… the hell. How come didn’t I try believing KC Concepcion for this one? Hahaha! Yeah, it did make my skin a bit fairer (which kind of made me felt awkward because it’s fairer… yeah) right after applying it but it really didn’t matter… what I’m happy about it is that it made my skin smoother. Oh, I almost forgot. That was late night already when I first used it. When I checked my face up first thing in the morning, I was surprised… my face was like WOAH! I’M FLAWLESS! Hahaha! Really. I’ve never been happy with a moisturizer that does what it’s not intended to do… and that is making my skin smooth. I guess it closed my pores and all. Oh, I’m sorry. I got carried away. I was talking about the Light cream whiten and protect… something. Yeah, not the product you discussed above. I guess I have to try that one since Garnier didn’t disappoint me. Also, it evened out my face after 5 days. Can you believe that? I’m not sure if there’s anyone who sells Garnier products online since it’s available locally at Watson’s outlets in particular. 🙂 Hence, you can check ebay.ph. Is this not a lie??? ?I’ve been using a lot of whitening creams still NOTHING WORKED for me. I have a sensitive and pimple prone skin.Please don’t disappoint me. This is based on my experience. However, comments here could be based on the commenter’s experience as well. Since you have tried the Garnier LOPC, do you ever breakout? Cos I’ve been wanting to try out this cream since the tan that i got has gradually caused my skin to appear dull and bouts of uneven skintone.. what a nightmare. plus this has caused my skin to look bad without any makeup on. thus i am on my journey to address my skin woes. I need a good whitening cream so as to achieve my originaly fair skintone. Oh and have you tried using Garnier Light Oil Control Whitening Cream? If so, could you do a review..pretty please? Sorry for the late reply! I did not experience any purging on my part when I was still using Garnier Light Overnight Whitening Peeling Cream. For your woes, I encourage you to try it! 🙂 Who knows, it may the solution for your current skin condition. Yesterday,I’ve just purchased the Garnier Light Overnight Peeling Cream. And have tried it for the first time last night and I’m quite pleased. Very moist yet not oily feeling.And i don’t breakout. hello poh gusto ko lang po malaman kung suitable ba yung garnier overnight peeling cream para sa mga oily at acne prone skin?wala na bang iba pang gamitin naproduct like toner?at saka wala bang side effect reaction pag gumamit sa product?thanx po hope u can answer my quest. it is great, really use it. as i am using Light Overnight Whitening Peeling Cream’s me feeling as if my skin going darker…..
i really appreciate this product…it makes my face look fresh all day..
how much po ba itong peeling cream na garnier, ang dami na kc ang pimples ko malalaki pa gr ihate it… kc positive nman ung nababasa ko sa mga comments dito… so tlagang ok ba tlaga? and how much po? In my experience, Garnier seems to be effective but it takes time for you to see the difference (perhaps, give it after a month or so?). i planned to use garnier night peeling cream .i am 16 year old .i dont have moustache if use this is it dangerous.